A breathable, mesh-backed black sports cap, with "USAO" in raised black and white lettering across the front. A green Nike beanie, with "USAO" embroidered in green and white text beneath the official Nike logo. A green and gold knit cap, with "USAO" in green text superimposed on a gold and white stripe, with a small USAO Drover over the bottom cuff. 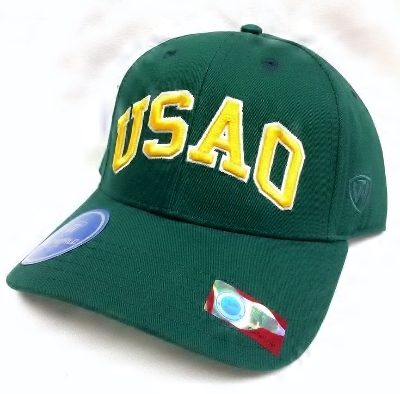 A durable, 100% cotton cap showing USAO spirit; the visor and backing of the cap are green, with a stone-grey overlay backing the text. "USAO Drovers" is in raised embroidery on the front of the cap. A small, gold USAO Drover mascot is present above the adjustment strap.